The Aderyn y Corph or corpse-bird chirps at the door of a dying person in Wales. Its call is dewch, dewch (“come, come”). It has no feathers or wings and can soar easily without them. When not presaging death it lives in the land of illusion and fantasy. It is a variant of the screech owl whose call portends death. Aderyn y corph is also Welsh for the screech owl or brown owl. Evan, D. S. (1858) An English and Welsh Dictionary. Thomas Gee, Denbigh. Sikes, W. (1880) British Goblins. Sampson Low, Marston, Searle, & Rivington, London. “Stray sod” is a general term used here to refer to any plant that, if trodden upon, causes travelers to lose their way. Stray sods have been reported primarily from France and Ireland, and come about in a number of ways. Usually they are specific herbs with magical properties that grow along footpaths. At other times they form over the graves of unbaptised children, or are patches of grass enchanted by fairies. They themselves may be fairies or inhabited by fairies. No matter the origin, the result is always the same. A solitary traveler at night will inadvertently step on a stray sod, and no matter how good their sense of direction, they immediately lose their path. All landmarks seem to vanish, all roads are dead ends. The unfortunate victim is compelled to wander aimlessly through the night, trudging through hedges and thorns, crossing rivers, slogging through marshes, and feeling their way through thickets. The spell is broken at daybreak, when they find themselves with their clothes torn and stained, their hands and feet bleeding, and miles away from home. When this happens it is advised to turn one’s coat inside out to counteract the spell. Other remedies include the usage of metal as abhorrent to fairies, or finding certain plants or benevolent spirits to regain one’s bearings. The stray sod is known as the herbe à adirer (“herb of misplacement”) in Anjou, the herbe à la recule (“herb of turning back”) in Besançon, the herbe d’oubli (“herb of forgetfulness”) in Brittany and Lorraine, the egaire in Normandy, and the herbe maudite (“damned herb”) or herbe des tournes (“herb of turning”) in Saintonge. 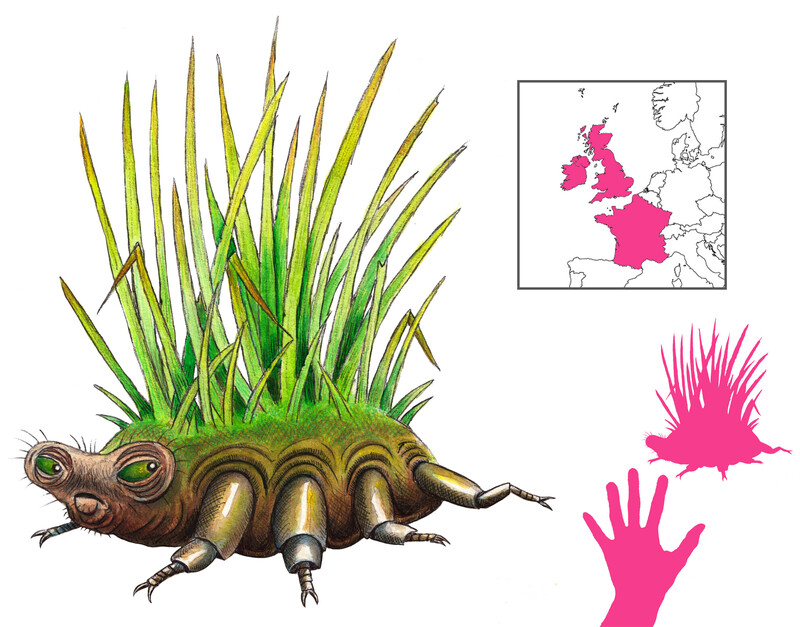 The ar iotan (“golden herb”) of Brittany is inhabited by a spirit that shines like a glowworm; touching a piece of wood or metal breaks its spell, as does changing horseshoes on one side. The lezeuen eur (“golden herb”) and the lezuenn er seudann (“herb of dizziness”) of the Morbihan cause their victims to walk in circles until daybreak. The herbe royale (“royal herb”) of Saint-Mayeux causes even horses to lose their way. The herbe d’engaire of the Berry grows in vast plains, and causes those who step on it to lose sight of the path entirely. The tourmentine (Potentilla erecta, formerly Potentilla tormentilla) of Forez, which causes disorientation for 12 hours, can be countered by the parisette (Paris quadrifolia), a plant whose fallen seeds guide travelers by pointing in the right direction. The faud shaughran of Ireland induces a sensation of flying, of being incapable of stopping until one is over twenty or thirty miles from home. There is a herb that counteracts its effects, but it is known only to the initiated. The similar fair-gortha causes unnatural hunger and craving for food if stepped on. One man in County Leitrim turned his coat and hat inside out but was unable to find his way home, ending up miles away from his destination. Barton, B. H. and Castle, T. (1845) The British Flora Medica. Henry G. Bohn, London. Dubois, P.; Sabatier, C.; and Sabatier, R. (1992) La Grande Encyclopédie des Lutins. Hoëbeke, Paris. Duncan, L. L. (1893) Folk-Lore Gleanings from County Leitrim. Folklore, vol. 4, no. 2, pp. 176-194. Rolland, E. (1904) Flore populaire, Tome V. Librairie Rolland, Paris. Sébillot, P. (1894) Les travaux publics et les mines dans les traditions et les superstitions de tous les pays. J. Rothschild, Paris. Sébillot, P. (1898) Les Forêts. Revue des Traditions Populaires, t. XIII, no. 12, pp. 641-661. Sébillot, P. (1904) Le Folk-Lore de France, Tome Premier: Le Ciel et la Terre. Librairie Orientale et Américaine, Paris. Wilde, F. S. (1887) Ancient Legends, Mystic Charms, and Superstitions of Ireland, v. II. Ward and Downey, London. Welsh fishermen, especially around Llyn Gwynan and Llyn Glas, have to contend with the attention of the troublesome Water Spirit, the Llamhigyn y Dwr or “Water Leaper”. 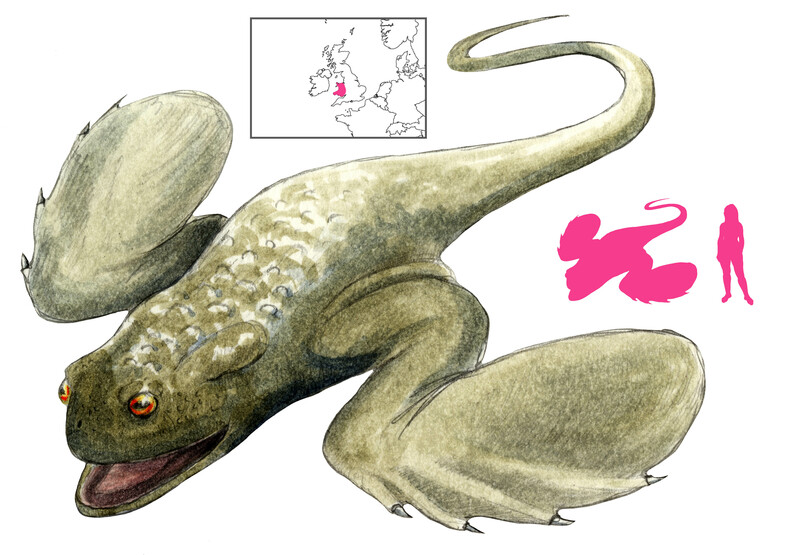 A llamhigyn y dwr looks like a large and monstrous toad, except with a long tail and wings instead of legs. It hides in lakes and other bodies of water, and is carnivorous by nature. Shepherds know not to let their sheep or dogs near the water’s edge, lest the llamhigyn y dwr pounce on them and drag them below. Fish lost to anglers in those lakes are always the work of a llamhigyn y dwr. It will take the bait cleanly off hooks, or even pull fishermen into the lake. They are fast and powerful swimmers, and will run away with hook, line, rod, and angler. One fisherman’s grandfather told of hooking a llamhigyn y dwr, only for it to emit an ear-splitting shriek, and it would have pulled him off the boat had his friend not been with him. These tales of the llamhigyn y dwr were told – with significantly more colorful language – by one Ifan Owen, a trustworthy angler by trade with no reason to exaggerate. Jones, T. G. (1930) Welsh Folklore and Folk-custom. Methuen and Co., London. Rhys, J. (1901) Celtic Folklore: Welsh and Manx, vol. I. Clarendon Press, Oxford. 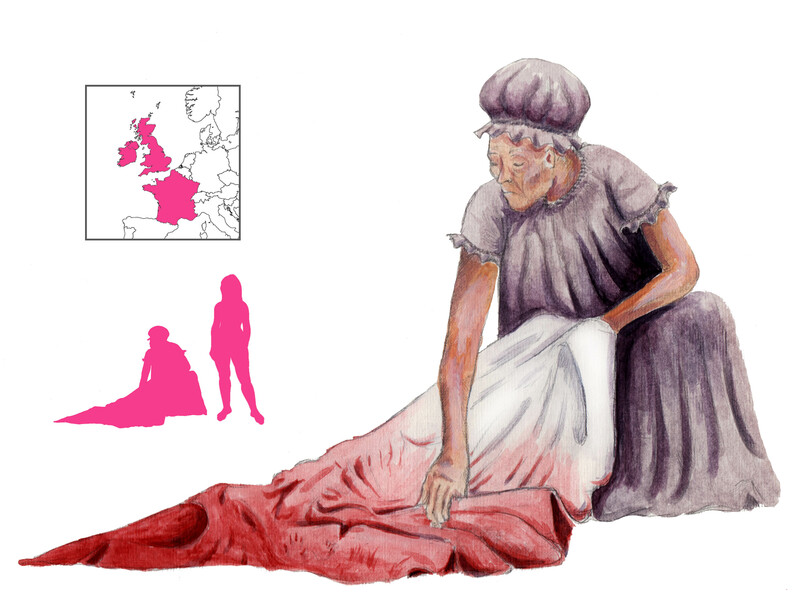 The lavandières de nuit (“washerwomen of the night”) are present in some form or other from Scotland to Provence. Their exact nature is uncertain; sometimes they are ghosts, other times members of the fairy kingdom. Their best-documented haunt is Brittany. Tors la guenille, tors // Le suaire des épouses des morts. (Wring the rags, wring // the shroud of the wives of the dead). Often a lavandière is condemned to wash a shroud in atonement for a sin committed in life. Some merely did laundry on Sunday. Others were greedy misers who denied decent clothing to the poor. The grimmest were those guilty of infanticide. The outline of a baby’s corpse could be seen in their blood-soaked sheets; try as they might, the blood never washed out, and the bones never whitened. The bean nighe of the British Isles are women who died in childbirth before their time, and who are doomed to wash the clothes of those fated to drown until the day when they were meant to die. Their appearance foretells death. Some are aligned with the Morrigan, and wash the corpses of the dead. Cú Chulainn saw one, the daughter of Bodhbh, washing bloodstained clothes and weeping; he died in battle not long after. In France, especially in Brittany, they call passers-by to help them wring out the laundry. This isn’t a choice – those who accept out of ill will get their arms broken, and those who refuse are drowned. To escape their clutches, one must wring in the same direction they do, turning clockwise when they turn clockwise and vice versa. But this has to be kept up all night, and the lavandières never tire. One false move and the unfortunate victim is crushed, wrung out, their corpse mangled beyond recognition. Even the strongest man is no match for a lavandière, who wrings humans out as easily as a pair of tights. Another way of escaping their clutches is to tell them Diwasket ho poan ha me diwasko ma hini (“wring out your sins, and I will wring out mine”). Running away at top speed always helps, and lavandières cannot cross recently-ploughed fields. Finally, making the sign of the cross or reciting Biblical verses is always helpful. The lavandière of Chantepie was a stingy woman who buried her husband in a dirty shroud. She continues to wash it every night. The lavandières of Fond-de-Fond hold up the bodies of the recently-deceased. In Landéda, the lavandières are powerless against the goodhearted, but tie the sinful into knots. The lavandière of Noes Gourdais, near Dinan, appeared early in the morning and had a skull for a head. The Mille-Lorraines of Lower Normandy form fairy circles around ponds. 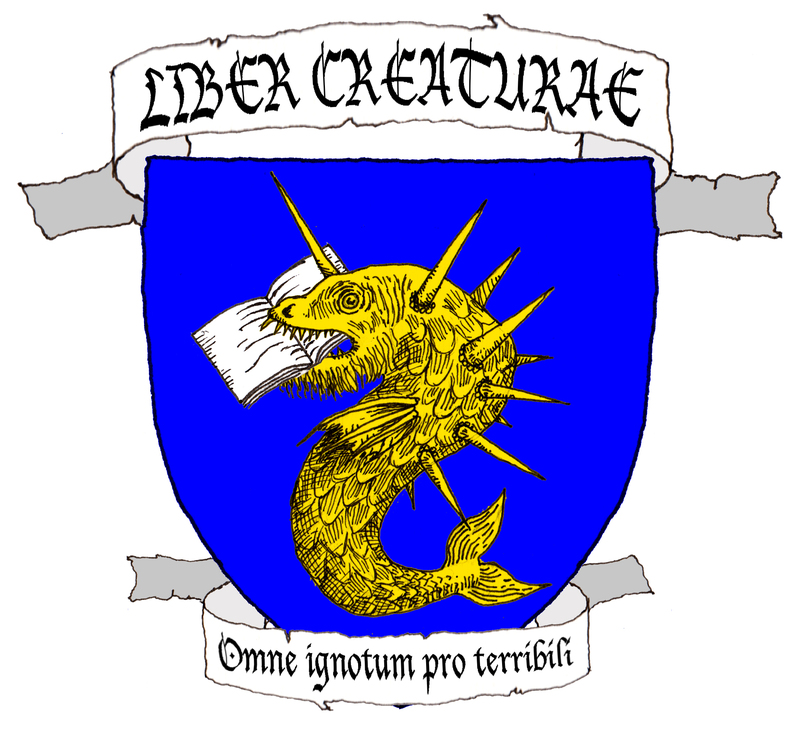 Several lavandières gather in the pond of Roc-Reu, and drown anyone who tries to touch them. Around Dinan, the teurdous (“twister”) is a rare male counterpart. He does not wash, but instead offers to help washerwomen wring out their laundry. If they accept, he breaks their arms. The true nature of the lavandières is more prosaic. Unfamiliar sounds have been invoked – the croaking of frogs or toads, for instance, might have suggested the sound of washboards. The lavandières themselves may have had nothing supernatural about them. A number of flesh-and-blood women may have had reason to do laundry at night: those who worked during the day, those who did not wish to be seen doing menial work, those who wanted to clean the clothes of their illicit lovers… Anyone coming upon them could be forgiven for seeing them as ghosts. Others managed to exploit the superstitious fear of lavandières. A garde-champêtre in Vaucluse once stumbled upon a pair of lavandières in spectral white clothes. “Wring the laundry!” they cackled, grabbing him by the collar. And wring he did, all night long. He also noted the fine quality of the cloth they were washing, but did not dare stop until morning, when they left. Only later did the warden find out that a nearby castle had been robbed of various items of clothing. He had spent the whole night helping the thieves wash their ill-gotten gains. Giraudon, D. La lavandière de nuit Ar gannerez-noz. In Loddo, D. and Pelen, J. (eds.) (2001) Êtres fantastiques des régions de France. L’Harmattan, Paris. Kilfeather, A. (2003) Legend and wetland landscape in Ireland. Journal of Wetland Archaeology, 3, pp. 37-50. Le Quellec, J. (1988) Le légendaire du Sud-Vendée: organisation spatio-mythique. Etuderies 3-4. MacPhail, M. (1898) Folklore from the Hebrides III. Folklore, Vol. 9, No. 1, pp. 84-93. Sand, G. (1877) Légendes Rustiques. Ancienne Maison Michel Lévy Frères, Paris. Sébillot, P. (1881) Littérature orale de la Haute-Bretagne. Maisonneuve et Cie, Paris. Sébillot, P. (1968) Le folklore de la Bretagne. Éditions G. P. Maisonneuve et Larose, Paris.